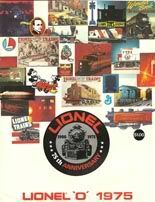 Lionel commemorated its 75th anniversary with this impressive train set offering. All pieces feature Lionel markings. Power was the U36B pulling four sliding door box cars, two reefers and one covered hopper, plus an illuminated caboose. Set included a Santa Fe 2-4-0 Steam Engine and Tender, Nickel Plate Gondola, C&O Flat Car with Stakes and Santa Fe Caboose. Track plan as a 27" x 36" oval. Transformer included. A C&O 4-4-2 and tender with sound pulled a Rio Grande Gondola with Canisters, N&W Auto Carrier, Chessie Hopper, Santa Fe Bulkhead Flat Car with Stakes and C&O Caboose made up this set's engine and rolling stock. This set featured Lionel's Alco A and B in Santa Fe paint pulling a CN Hopper, BN Gondola with Canisters, Ford Motorcraft Box Car, Republic Gondola, UP Flat Car with Stakes and Santa Fe Caboose. Lionel's Alco A in Santa Fe's Freight Warbonnet scheme pulling a CN Hopper, Republic Steel Gondola, Penn Central Log Dump Car and Santa Fe Work Caboose. A large 36" x 45" squared oval track was provided with transformer. The Southern Express had a green 2-4-0 Steam Engine with sound pulling a Republic Steel Gondola, CN Hopper, UP Flat Car with Stakes and Southern Caboose. A figure 8 layout measuring 27" x 64" was provided with transformer. A Pennsylvania 2-4-0 with sound powered the Thunderball Freight introduced in 1975. Rolling stock included the Great Northern Hopper, Union Pacific Flat Car with Stakes, Southern Pacific Gondola and Penn Central Caboose. Basic starter set from Lionel with a U. S. Steel Industrial Switcher pulling a Nickel Plate Road Gondola, Union Pacific Flat Car with Stakes and a Reading Bobber Caboose. A 27" x 27" circle was the track plan and the set included a power pack. A Soo Diesel Switcher with Burlington Northern Gondola with Canisters, Rio Grande Double Door Box Car, Great Northern Hopper, Republic Flat Car with Stakes and Soo Work Caboose.